Will the return of Sidney Crosby give the first-place Penguins just enough to hold off the Devils and capture the Atlantic Division title? With less than two weeks remaining in the regular season, who has the edge to win the Atlantic Division and perhaps the Eastern Conference? Will it be the defending champion Devils, who follow Tuesday night’s showdown against the Penguins with two meetings each against the Rangers and Flyers and single games against the Islanders and Bruins? Or will the upstart Penguins win their first division title in 10 years with a schedule that includes six games evenly divided between the Rangers, Flyers and Islanders? Here’s a primer for both team as they race toward what promises to be a furious finish. 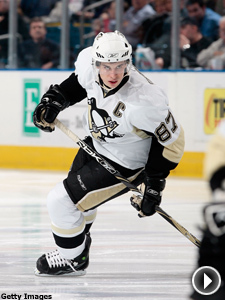 * Is Sidney Crosby healthy enough to make a difference? Crosby is practicing and says his ankle is feeling stronger than it was before he returned for just three games earlier this month. But even though first place is on the line, the Penguins won’t rush him back to the lineup. And why should they? After their impressive 7-1 rout of the Devils on Saturday, the Penguins have gone 15-7-4 without their captain, who has missed 26 of the past 29 games because of a high right ankle sprain. * Who will Crosby play with when he returns? Crosby almost certainly will be paired with right wing Marian Hossa, and since the line of Evgeni Malkin, Ryan Malone and Petr Sykora is red hot, look for coach Michel Therrien to put Crosby between Hossa and Pascal Dupuis. "I don't think it's going to take too long, to be honest," Crosby said of finding chemistry with Hossa. "From watching him and seeing our two styles, it should work out all right." * Will Crosby’s return slow Malkin’s pursuit of Alex Ovechkin in the scoring race? Not likely. In fact, it might enhance it. Through the weekend, Malkin had 102 points, four behind Ovechkin’s 106, and the Pens’ had a game in hand on the Capitals. With Crosby quarterbacking the Penguins’ power play, Malkin could one-time his way to the top of the scoring charts. "I'm having a lot of fun ... because the team is winning," Malkin said through an interpreter. "It's one of those things where he wants to step up and prove he can lead,” Crosby said of Malkin’s emergence as a money player. “There's no reason why we can't both do that." * Who will be in goal for the Penguins down the stretch? It sure looks like Marc-Andre Fleury will be given every opportunity. Since returning late last month from a high right ankle sprain he is 6-1-0 with a sparkling .939 save percentage. * What kind of effect will the Devils’ 7-1 loss have on Tuesday’s rematch with the Penguins in Newark? Sutter’s right. The Devils are 5-5-2 in their last 12 games and have scored just 20 goals in those dozen games. In each of the Devils’ last three losses, they’ve netted just one goal. But New Jersey’s offensive struggles go deeper than that. The Devils are 7-24-5 when scoring two goals or less and 35-2-2 when scoring at least three times in a game. * Are there signs of hope in Newark? Any team that has Marty Brodeur has a chance to go to the Stanley Cup Final. Saturday’s blowout loss was an aberration of sorts. It was the first time all season the Devils have allowed more than five goals in a game. The Devils also hold an edge over the Penguins if the two teams finish with identical point and win totals. Heading into their final meeting, the Devils owned a 4-3 advantage in the series, with one of the games decided in overtime. The Devils are hoping that center Travis Zajac can rediscover his scoring touch in time for the playoffs. * Where do the goals need to come from? Let’s start with center Travis Zajac, right wing Brian Gionta and left wing Zach Parise. Zajac has just two goals in his last 23 games. Gionta has one in his last eight and Parise has gone six straight without a goal. The Devils should get a boost from Patrik Elias, who has missed one game with a bruised knee and three more with the flu. Bottom line, Sutter won’t tolerate an extended slump at this time of the season. “You can't accept mediocrity,” he said. “You have to want to be better. This game is all between the ears and we have some work to do on that." Around the Atlantic -- Speaking of battling for playoff position, the sixth-place Rangers are suddenly fending off a challenge by the seventh-place Flyers, whose three-game win streak moved them within two points of the Rangers heading into Tuesday’s showdown between the two teams. (Great night for scoreboard watching). The Rangers, already without fourth-line center and penalty killer Blair Betts for the rest of the regular season, could be without top scorer Scott Gomez on Tuesday night. Gomez crashed into the boards against the Flyers on Friday night and suffered bruised ribs. The injury might only keep him out of one game, but he’ll be in pain for the remainder of the season. “Other teams in our conference have overcome injuries,” said Rangers veteran Brendan Shanahan. “Just look at Carolina, Pittsburgh. Other players have to view it as an opportunity." That would likely be Petr Prucha, who has been a healthy scratch for 10 straight games. Rangers coach Tom Renney might finally enlist the help of Prucha to help a sputtering power play that has gone 1-for-26 in its last eight games. Prucha has just 17 points in 56 games after netting 40 or more points in his previous two seasons. Look for him to play on a line with Sean Avery and Shanahan on the right. As for Betts’ replacement, the Rangers are counting on gritty Ryan Hollweg to eat up some of his ice time when they face the Flyers. The Flyers, meanwhile, have resurrected their season. Since hitting rock bottom last month with a 10-game losing streak, they’ve gained at least a point in 11 of their last 14 games (8-3-3). But the Flyers are beginning to distance themselves. With three straight wins, the Flyers are now two points ahead of the eighth-place Bruins and four ahead of the ninth-place Washington Capitals with six games to play. The Flyers’ power play is ranked second in the NHL this season and a big reason is their success against the Islanders. In seven games against them this season, six of them wins, the Flyers are 13 for 31 on the man-advantage for a 31.9 percent success rate. The Flyers have one more date with the Isles and Rangers, along with two games each against the Devils and Penguins. As for the banged-up Islanders, they’re getting their first good look at right wing Kyle Okposo. The 19-year-old rookie who was taken by the Isles with the seventh pick of the 2006 draft had a goal and an assist in his first two NHL games and scored his first career goal against none other than Marty Brodeur. “I’ll have to tell my kids that someday,” Okposo said.